This electric force calculator will enable you to determine the repulsive or attractive force between two static charged particles. Continue reading to get a better understanding of the Coulomb's law, the conditions of its validity and the physical interpretation of the obtained result. Coulomb's law, otherwise known as Coulomb's inverse-square law, describes the electrostatic force acting between two charges. The force acts along the shortest line that joins the charges. It is repulsive if both charges have the same sign, and attractive if they have opposite signs. The unit of electric charge is a Coulomb (symbol: C). It is defined as the charge that is transported by a constant current of 1 ampere during 1 second. Hence, 1 C = 1 A * 1 s expressed in SI units. If you don't remember what an ampere is, head to our Ohm's law calculator. Charges must be stationary - they cannot move with respect to each other. Point charges are assumed. This assumption holds also for any charges that are spherical and symmetric. For example, a charged metal sphere fulfills this condition, but a charged metal box doesn't. Charges cannot overlap - they must be distinct and have at least a minimal distance between them. Force obtained with the help of our Coulomb's law calculator can be either positive or negative. Positive force implies a repulsive interaction between the charges. Negative force means that the interaction is attractive. Interested in electricity? Check out our electricity cost calculator, too! 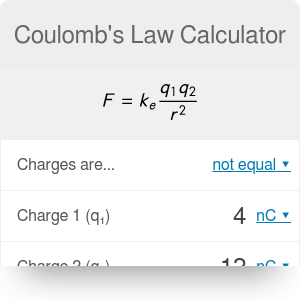 Coulomb's Law Calculator can be embedded on your website to enrich the content you wrote and make it easier for your visitors to understand your message.